Paper Models Inc, announced today that it opened its first virtual store in a virtual world, selling it’s real world products in a virtual format to virtual citizens said Lon Safko, president and creator of Paper Models, Inc. (www.PaperModelsInc.com). Paper Models, Inc. is a San Diego, California based virtual store operating in the cyberspace of a Yahoo Store selling virtual products since 1999. Paper Models, Inc. has been in the business of selling corporate specialty advertising items and school projects in the virtual format of pdf files. Simply by going to the Paper Models web site, the user can select any of nearly 100 famous landmarks such as the Alamo, White House, Capital Building, or California Spanish Mission, enter a credit card and for under $10 download everything they need to build that famous landmark and write an A+ report for their school project. The company, store, products, transaction, and even delivery are completely virtual and without human intervention.Lon Safko (www.LonSafko.com), its founder and innovator has taken concept one-step further. 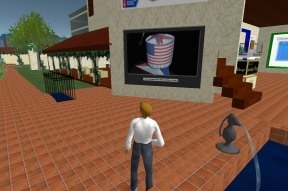 He’s opened the world’s first virtual store selling virtual products to virtual citizen or avatars in Second Life. Second Life is an immersive 3D environment similar only in looks to a video game where people from all over the world walk around, meet, and interact through the use of their custom created avatar. Second Life now has more 10 million subscribers, with as many as 53,000 virtual citizens at one time experiencing this world at any given moment. The Paper Models virtual store can be found in Second life through what is referred to as a SLurl or Second Life URL: Once the free Second Life software is installed on your computer, by selecting this SLURL, your browser will transport you the Paper Models Virtual Store, which is located on the island of Pinastri in the Villa called Casa de Estaban, which is owned by Estaban Graves, (Second Life name), Steven Groves, (First Life name) who was instrumental in creating the model of the American Cancer Society’s SL virtual “Memory Tree”. 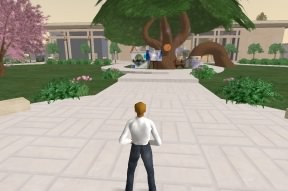 This world’s first virtual model, of a virtual landmark, for an actual society, can be downloaded from their virtual island, by virtual citizens, representing actual people, printed from an actual printer, and constructed in real life for free. Companies like IBM, Dell, AOL, Coldwell Banker, NBA, Reebok, Nissan, Sun, Cisco, and Microsoft all use SL to conduct their business.Once transported your avatar can explore the rooms of this villa, select a wall displays for educational content, and even download your own free paper models that can be printed and constructed into real life replicas of actual objects and landmarks. Lon Safko or Lon Sands (Second Life name), has also been accredited with creating the “First Computer To Save A Human Life”, based on an early Apple Computer, which now resides in the Smithsonian Institution, in Washington, D.C. along with 18 of Lon’s inventions and more than 30,000 corporate documents.